I am absolutely enamored with Dylan by Whistler Studios. This beautiful collection has richly textured prints with a simple color palette of black, blue, taupe and ecru. All patterns are perfectly coordinated to be mixed and matched. Dylan can be used in so many different ways; use it as whole cloth or cut it into smaller pieces to make patchwork projects. 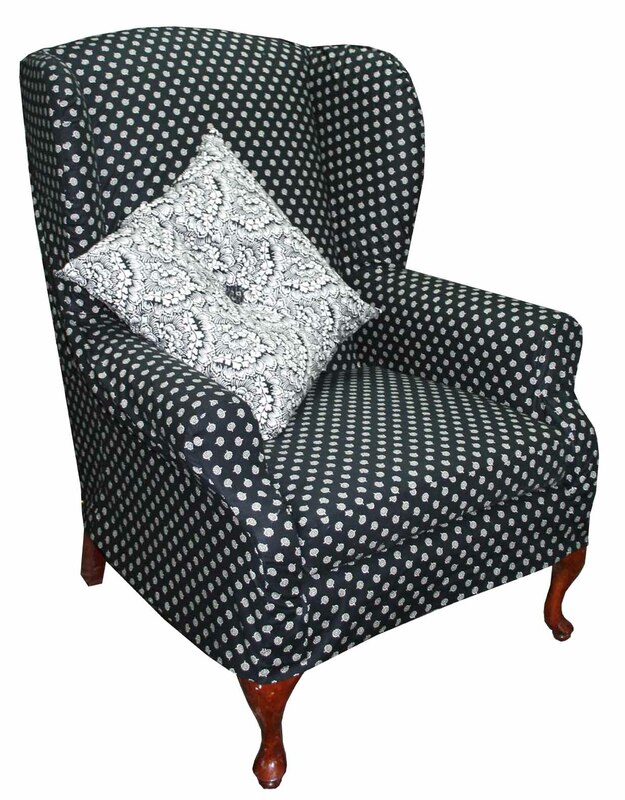 Use Dylan to slipcover your favorite chair and give it a fresh new look. Go all out and make a coordinating pillow to match. 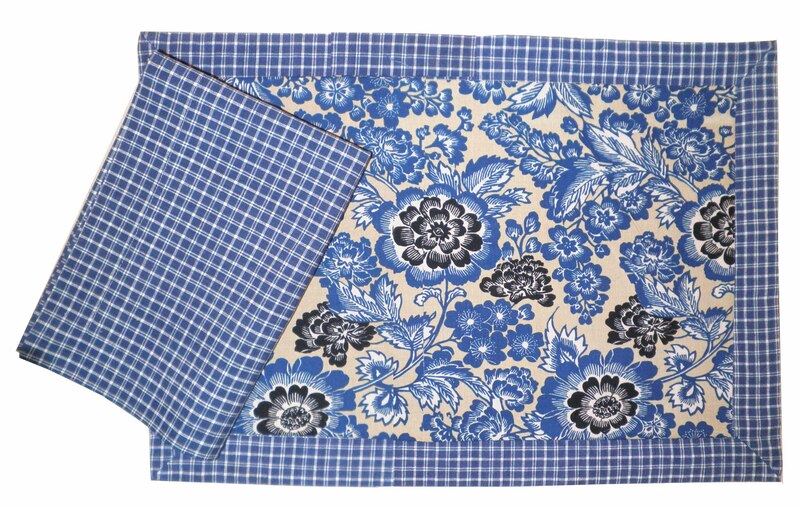 Spice up your dining room and kitchen and make a patchy table runner with harmonizing placemats and napkins. Feel at home with Dylan and make big comfy pillows to add that extra something to your most cherished couch. 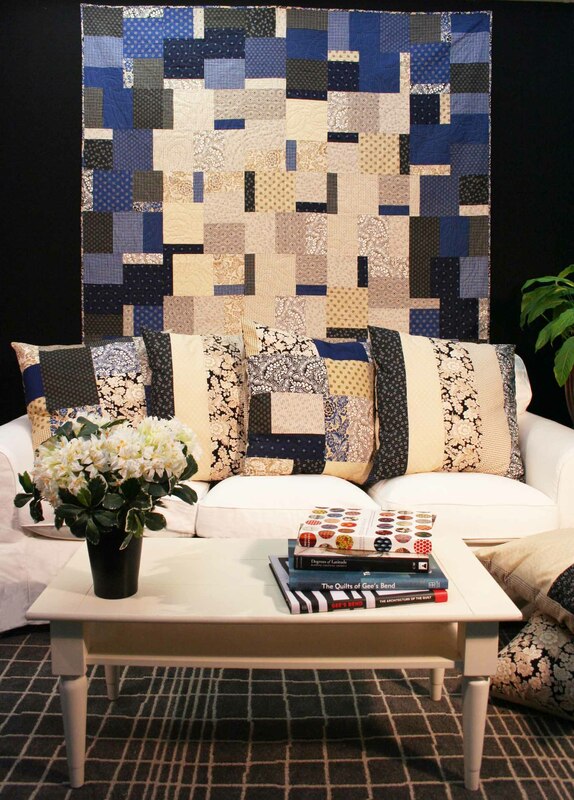 Tie together your entire living room with a matching quilted wall hanging (Windham Fabrics Free Project “Really Dylan Patchwork”). Your home will never have looked better! Dylan is in stores now so be sure to get in touch with your local fabric shop. To view the entire collection go to the Windham Fabrics website. We would love to hear some of your ideas! Win a Fat Quarter of Dylan by telling us below what you would make with the fabric?? One lucky winner will be picked at random. The winner will be announced next Monday so be sure to check back here. I’m a quilter, so I’d love to do patchwork pillows and table runner. From the pictures you feature I love the room setting, that beautiful chair and those lovely plaacemats. If I had a fat quarter, I’d probably make a table cover, small wall hanging or mini quilt and save every last scrap for an applique. I like the idea of making pillows for my living room. I adore “adult” prints for little girl dresses. Bet I could come up with a cute one! I’ve been itching to make a good dress lately, but I’d also like to try a sort of Oxford-style satchel – these fabrics are gorgeous! I think these fabrics would be fabulous for our Wiregrass Quilters Guild Albany group quilt to raffle. The fabrics are fabulous and would fit into most decors! Anxious to see if I can be a winner!! I think it would be great to make a focus wall with blocks mounted in same-size frames/or stapled to artist canvas of all the fabrics. I absolutely love that chair & pillow! That combination would be sweet when made into a shoulder bag or tote. Thanks “sew much” for the chance to win! These fabrice would make a nice masquline throw. Would make one for my hubby. Thanks for the chance to win. It would have to go into a delicious applique, perhaps a Baltimore Album style. Dylans fabrics are both feminine and masculine which is hard to find in a line of fabrics. I would most definitely have to make a quilt for my husband with the fat quarters if I were to win. Thanks for a great give-away and Good Luck Everyone!! My nephew was just married. I would love to make the couple a beautiful bed quilt with these fabrics. These fabrics would look great as cushion slipcovers for my living room rocking chair and an ottoman. Thanks for introducing me to this great new collection of fabrics. Congratulations to Maria Carroll14 you are the winner of the Dylan Fat Quarter. Send your mailing address to jennifer@baumtextile.com. Everyone stay tuned a 4th of July contest will be posted in a few hours!! Simply put I definitely value your endeavors. I will be looking out for the up coming write-up. Thank you for sharing your material.